What is CF? | What are the symptoms of CF? | How do people get CF? What kind of medicine and treatments are used for people with CF? Is there a cure for CF? | What can I do to help? 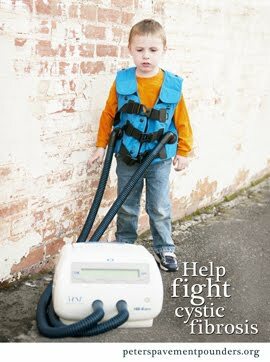 CF stands for cystic fibrosis, a life-threatening genetic disease that is caused by a defect on chromosone 7. This part of the DNA tells the body how to make a protein called CFTR (cystic fibrosis transmembrane conductance regulator). The CFTR protein (pictured below) allows the transfer of salt into and out of the cells in mucus-producing organs like the lungs, the pancreas, and the intestines. This transfer of salt in and out of the cells creates slippery, healthy mucus. However, in patients with CF, the CFTR protein does not function correctly, so instead of having normal mucus, CF patients have thick, sticky mucus that clogs organs and creates a breeding ground for infection and bacteria. There are over 1000 different mutations of CF, but the most common mutation is called ΔF508. Peter has two copies of this mutation. In ΔF508, three amino acids are deleted in the CFTR protein (see above--site of common phenylalanine deletion). This causes the protein to be shaped the wrong way, so the cell rejects and destroys the protein before it even gets to the cell wall. Without the proper balance of water and salt, mucus-producing organs do not function correctly in people with CF. 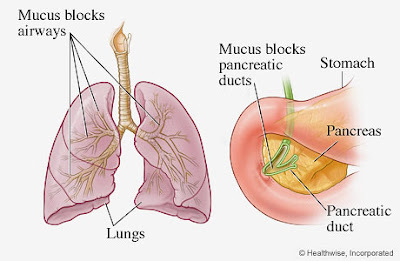 In the pancreas, the ducts which carry pancreatic enzymes to the intestines are blocked. Without pancreatic enzymes, the body cannot digest fats, proteins, complex carbohydrates, or fat-soluable vitamins. Peter and most other people with CF take pancreatic enzyme replacements (enzymes) with every meal they eat in order to digest their food. The pancreas also produces insulin, a hormone that delivers glucose (sugar for energy) to organs. Over time, the thick secretions in the pancreas may damage homone-producing cells, causing insulin deficiency and CF-related diabetes (CFRD). 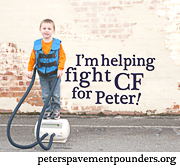 Peter does not have CF-related diabetes at this time, although his chance increases as he gets older. 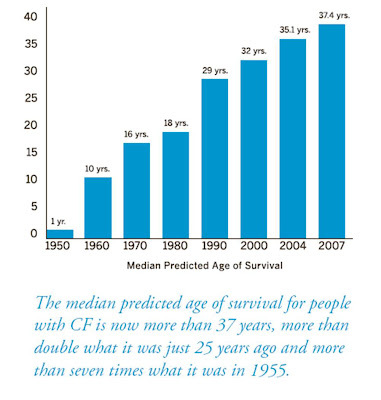 About 1 in 3 CF adults (age 20-29) have CFRD and that possibility becomes greater with age. In the lungs, CF is especially damaging. Lungs are like upside down trees with millions of little air sacks like the leaves of a tree. CF mucus pools in these air sacks and can be extremely hard to clear out completely. Unfortunately, bacteria and infection love to grow in these pools of mucus, so staying well and keeping well is always a challenge. Eventually, most people with CF battle with chronic lung disease which can lead to lung failure. Lung transplantation is often the only chance for survival at this point. CF affects other organs as well including the respiratory tracts, the liver, sweat glands, and the reproductive system, though they are not as serious as the threat of chronic lung disease in CF. 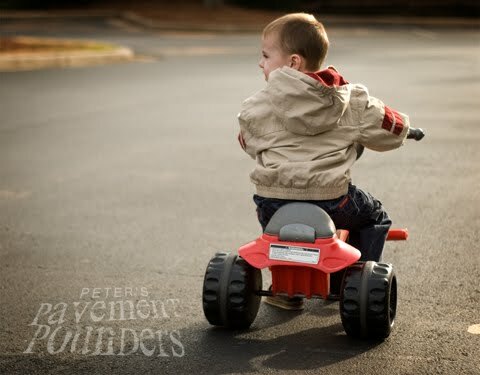 Peter has struggled with sinus issues since he was a baby. The mucus clogged and hardened in his sinus passageways causing him to have very little nasal room to breathe. Because of this, he had to have two sinus surgeries to clear out the passages. We also do sinus rinses everyday to keep things clear. People get CF when they get two copies of the defective CFTR gene. 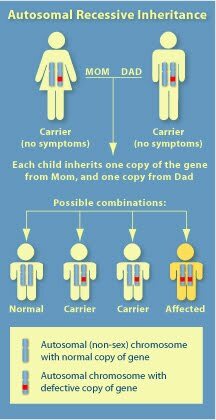 That means both their mom and dad are CF carriers; they each have one copy of the defective gene. Every child that this couple conceives has a 1 in 4 chance of getting both copies of their parent's defective genes. When a child gets both copies of the defective gene, that child has CF. CF carriers are symptomless, and most people don't know they are carriers unless their child is diagnosed with CF. Approximately 1 in 31 Americans is a symptomless carrier of CF. Because CF is an inherited disease, you cannot "catch" the disease from someone who has CF. Most people are diagnosed with CF as young babies or children because of failure to thrive, meconium ileus, and other symptoms listed above. However, later diagnosis of CF (even in adults) can occur. CFers take a lot of medication and spend a chunk of their day doing treatments. CF is a chronic disease, so much of the medications and treatments are aggressive preventative measures to keep lungs healthy and promote a healthy weight. The following are types of medicines most CFers use or will use throughout their lifetime. *Peter is currently on these types of medications/doing these treatments. In addition to the medication and treatments required, people with CF are also encouraged to maintain a high calorie, high fat, high protein diet. CFers burn more calories than normal because of the extra work their body has to do combating the mucus. Also, even with medication, CF digestive systems can't absorb food as well as normal digestive systems. So yes, Peter gets double-buttered toast, as much cheese and french fries as he wants, and lots of high calorie nutrition drinks along with a normal toddler diet. Currently, there is no cure for CF. Yet people with CF are living longer and longer today that ever before because of medication and treatments. Until now, these only addressed the symptoms, not the cause of CF. But things are changing. This year, for the first time, drugs in development are aimed at treating the basic genetic defect in CF! While these drugs aren't available to patients outside of the clinical trials, the prospect of a cure doesn't seem out of our reach. For more information about current medicine research, visit http://www.cff.org/research/DrugDevelopmentPipeline/. 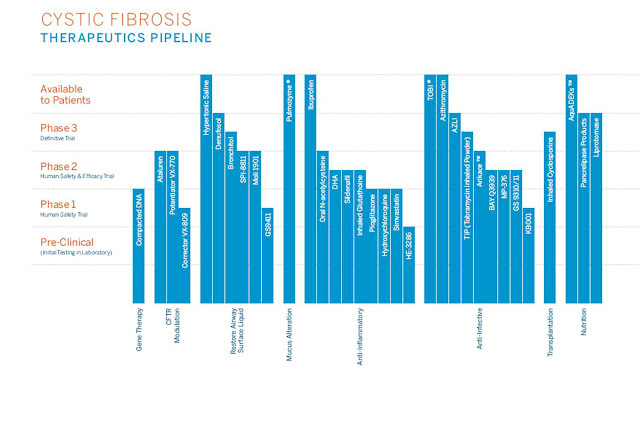 The CF Foundation has been pivotal in nearly every drug developed for cystic fibrosis. This has been because of the enormous support of friends, families, and businesses who have donated their money, time, and energy to the cause. 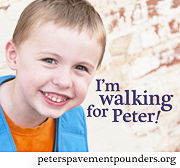 There are lots of opportunities to help, including walking with Peter's Pavement Pounders at Great Strides. For more ideas on how to help, see http://www.cff.org/GetInvolved/.